The New Generation MX System is easier, faster, and more cost effective. The clear Minimag is 50% stronger than the original, resulting in powerful clamping of the joint. Drilling Gauge Set Rasto(MONO). One universal drilling gauge with pins and drill bushings for Invis Elements. Includes a strong plastic jig, drills and bushings sizes 5, 8, 10, and 12mm. All contained in a Systainer Case. New MX Starter Kit- everything you need to start with the new MX Joiners from Invis. 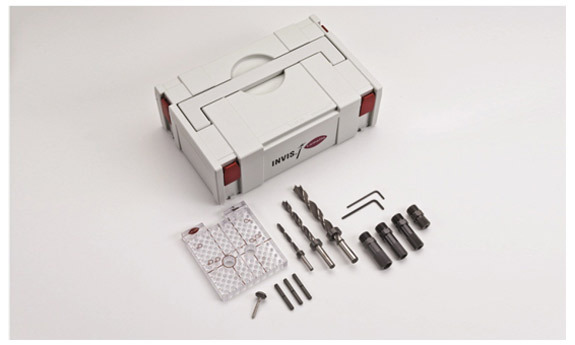 The Kit includes the new MiniMag MX, a flexible extension shaft to access hard-to-reach places, two insertion tools for the new MX joiners and one box of 20 joiners. All contained in a compact Systainer Box. Click on video to see how it works. INVIS is a product from the inventors of the wooden biscuit joinery technique in Switzerland. This new, invisible, detachable joining system is a unique way to save time and efforts by allowing to join two parts with a completely hidden fastener, while leaving it detachable at any time. 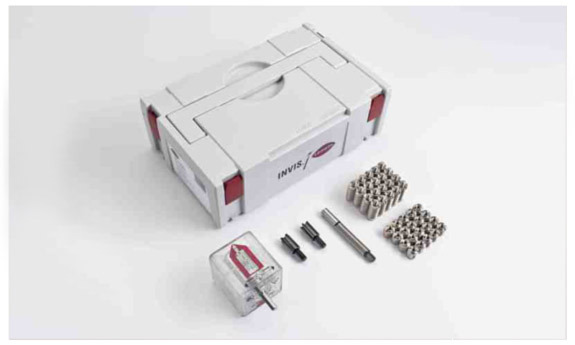 This offers almost limitless applications, using INVIS in combination with other joining techniques. Whether you are looking for solutions to provide proprietary access, special aesthetics, knock-down installation, invisible clamping or joining dissimilar materials, INVIS can do the job. There is nothing comparable in the market and this is why the new product has won so many prestigious international awards. We hope to include you as one of our leading innovators.